Engineers, architects, and construction managers all have one major thing in common – the need to efficiently store technical drawings. The best option is to scan them. But if your company can’t do that, then you need another way to store them. 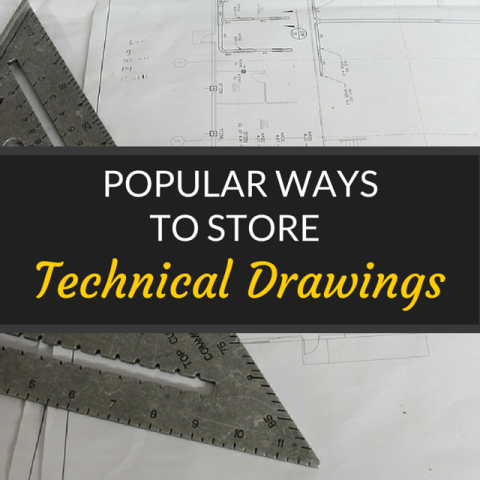 Here are 3 of the most popular ways to store technical drawings. Rolling up your technical drawings and storing them in cubby shelves works great for most document types and sizes. You can store multiple sized drawings within just one cubby. And because they are rolled up, they are easy to access. Another reason to store technical drawings in cubby shelves is that your drawings are up off the floor and safe from potential damage. Finally, the cubby shelves are very cost-effective when you have a large amount of technical drawings to store. Within each drawer of the flat file cabinets you can store a large amount of technical drawings. And because they are stored flat instead of folded, you can be sure there won’t be any creases or marks. The cabinets also protect your drawings from potential environmental damage. 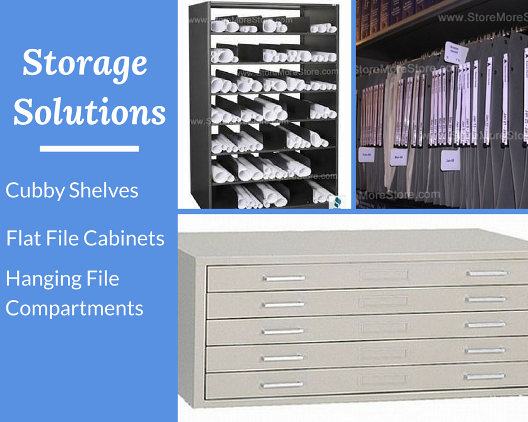 The flat file cabinets are more expensive; however, if you need your technical drawings secure, they are your best option. If you group technical drawings together and need them labeled, then storing them suspended in hanging file compartments is a great option. The hanging file compartments also work really well if you already have shelving in place because the compartments will fit right in. And once again because your drawings are stored flat, they are safe from damage. There are many different ways you can store your technical drawings, but these are by far the most popular. And you can find them all online from us at StoreMoreStore. And if you need another option or have any questions, please give us a call at 1-855-786-7667.